During the 23rd Session, the Working Party held two technical meetings. The Working Party mandate encompasses conservation of natural genetic resources and ecosystems as well as genetic improvement by conventional breeding and application, molecular genetic tools and techniques, genetic transformations and new cultivars for a range of purposes (bioenergy, phytoremediation, water treatement, etc.). Strengthen the understanding, linkages and information flows between traditional breeding programmes and molecular genetic tools and technologies for Poplar and Willow integrated breeding programmes. During the 22nd session of the IPC, the Working Party held four technical meetings during which 16 scientific/technical papers were presented and a wide range of posters on genetics, conservation and improvement displayed and discussed at the poster sessions. Address recommendations to the Executive Committee on all matters that relate to genetic aspects of Poplars and Willows. The activities of the Working Party include the conservation of natural genetic resources and ecosystems and genetic improvement by conventional breeding, application of molecular genetic tools and techniques, genetical transformation and creation of new cultivars for phytoremediation, waste water treatment etc. Inventory of Poplar and Willow pollen collections conducted through a questionnaire survey of research institutions in IPC member countries. Use of Poplar as a 'model' tree for biotechnology research. Lack of financial support for breeding research projects and programmes. Collaboration with the IUFRO Poplar and Willow Working Group. General bias against tree breeding, particularly in Western Europe. Soundly-based breeding programmes are fundamental to support the multiplicity of functions of Poplars and Willows. Inter-organizational and multi-disciplinary approaches at national, regional and international levels. Guide to experimental design with Poplars and Willows, by December 2008 - Responsibility of Stefano Bisoffi, Brian Stanton and Francisco Zamudio. Genetics and breeding for phytoremediation (Production Systems and Environmental Applications of Poplars and Willows). Encourage inter-organizational and multi-disciplinary approaches at national, regional and international levels. On the basis of work done by pathologists and, to a lesser extent by entomologists, which brought out the hereditary character of susceptibility and resistance to diseases and some insects such as Phloeomyzus passerinii, poplar breeders felt the need to set up a structure of their own for coordination and cooperation which would open up great possibilities for the biological control of certain poplar enemies. Up to that time, breeders had confined themselves to taking part in the activities of the Working Party on Poplar and Willow Diseases and to closely observing the research results of pathologists concerning variability in the reaction of cultivated poplars to pathogens. Systematic work done mainly in Belgium on the hereditability of certain genetic characters showed that poplar genetics ought to have its place among the concerns of the IPC, which therefore agreed to the establishment of the new subsidiary body in 1971. The scope of the activities of this working party was discussed during its meeting in 2000. It was agreed that the subject areas should include all matters that relate, directly or indirectly, to the exploration, conservation and use of genetic resources of poplars and willows. More specifically the subject areas addressed include: i) conservation of natural genetic resources and ecosystems; and ii) genetic improvement by different means including conventional breeding, application of molecular genetics tools and techniques, and recombinant DNA technologies. Two important early activities of the working party may be mentioned. Thanks to cooperation and close liaison with the Poplar Council of the United States of America in the late 1960s/early 1970s, several collections of seed from various sources of Populus deltoides and P. trichocarpa were subsequently distributed to European countries involved in research programmes concerning those species. Then, thanks to a generous offer from the Academy of Forest Science of the People's Republic of China, the first collection of propagation material from various sources of P. maximowiczii, P. simonii and P. yunnanensis was distributed widely among member countries in the early 1980s. These undertakings were significant examples of the spirit of international cooperation that has always characterized the IPC member countries. By leading to the creation of new hybrids, they have been harbingers of a veritable revolution that has the potential to improve poplar and willow cultivation in several countries. One should not, however, underestimate the risk of spreading diseases through the exchange of material and close liaison with entomologists and pathologists must not be relaxed. Pathogens and insects have in fact been transferred together with the germplasm, as happened with the introduction of leaf rusts (Melampsora spp.) to Argentina, Australia, New Zealand and South Africa, the poplar mosaic virus to China, and Septoria musiva to Argentina. The working party has also drawn attention to the fact that populations of some native species were rapidly disappearing, either because they were displaced by agriculture or other land uses or because they spontaneously hybridize with cultivars. Natural stands of Populus nigra have almost disappeared in Europe and the situation for P. deltoides in North America has become very serious. Studies in China on the natural range and individual variability have been underway for a number of species, among which P. tomentosa deserves special attention. The main activities in central, western and southern Europe have been focused on the creation of Euramerican or inter-American hybrids; the selection objectives have primarily concerned the search for satisfactory resistance to parasites and environmental adaptation. Modern techniques of controlled cross-breeding have been used. In northern Europe the main research topics are vegetative multiplication and the development of multiclonal varieties of aspens, which have been widely used. Willow breeding has been very important in Argentina; the main focus there has been improved resistance to both parasites and flooding. Early in the 1990s the working party decided to concentrate on the following topics: (a) the potential of biotechnology in poplar breeding, (b) poplar breeding for extensive culture, (c) the status and perspectives of North American poplar resources, and (d) breeding of Asiatic willows. It also recommended that FAO should address a formal invitation to member and non-member countries to adopt appropriate measures to ensure that existing genetic resources of poplar and willow species, in natural and man-made stands be properly preserved, stressing the role that fast-growing species may play in reducing the pressure on delicate and endangered natural environments worldwide. Member countries were invited to design model programmes around Populus deltoides and P. nigra in consideration of their great importance in breeding programmes and the existing threats of genetic pollution from cultivated varieties. to promote case studies on the conservation of poplar and willow genetic resources. 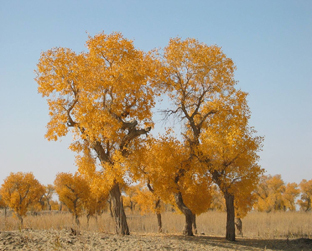 It had been known for some years that Populus euphratica was of particular interest to a number of member countries, because of its resistance to drought, salinity and flooding, and also because of the properties of its timber. In 1994 the working party recommended the expansion of fundamental knowledge, particularly in the field of its ecology, physiology, and genetics; the conservation of natural stands in areas where they are diminishing seriously; the establishment of at least one Populetum euphraticum for in situ conservation; and the preparation of a monograph on the species. Subsequently, the working party acknowledged the action taken by FAO on monitoring the status of Populus euphratica and the related P. ilicifolia. It recommended that a similar effort be extended to other low-latitude species adapted to the warm and dry climates of many subtropical countries, especially P. yunnanensis and P. ciliata in Asia and species of the Aigeiros, Abaso, and Tacamahaca section of poplars in Mexico. In 1996 the working party recommended that special attention be devoted by member countries with long experience in poplar and willow breeding to the transfer of knowledge to countries where such culture was relatively new. Some of the germplasm grown in ex situ collections may no longer be used in one country but could still be useful in another, and it therefore recommended that member countries maintained such collections. The attention of member countries was drawn to the ongoing debate on breeders' and farmers' rights while in view of the nature of breeding programmes for improved wood production and other benefits, the working party drew the attention of member countries to the need for long-term commitment of adequate funding. Valuable breeding research activities have been developed by a number of the IPC member countries according to their unique, prevailing conditions. A range of research topics are being addressed in breeding for resistance to insect pests and diseases and germplasm conservation (e.g. EUFORGEN Programme in Europe on indigenous stands of Populus nigra). The applications of genetic marker aided selection programs and molecular tools are being used for development of more efficient breeding strategies and poplar genetic mapping in some countries. The main results are almost exclusively in poplar research, but it is proposed to extend this to willow species. The application of innovative technologies to poplar and willow breeding for production of biomass and energy end-uses, particularly with willows, in countries such as Sweden, the United Kingdom and Yugoslavia. The development of clonal material for applications in phytoremediation in collaboration with the working party on Production Systems and Environmental Applications for Poplars and Willows. At the twenty-first session of the IPC the working party approved the name change to the "Working Party on Genetics, Conservation and Improvement" to better reflect the broader scope that the working party had adopted over recent years. coordination of cooperative seed collection campaigns. The exploitation of genetic resources must be based on the principle of sustainability. Whenever possible and compatible with vital economic and social needs of rural communities, poplar and willow cultivation must be carried out in respect of existing natural populations, their territorial integrity, ecological balance and dynamic genetic evolution. Wherever native genetic resources exist, their use in genetic improvement programmes should be preferred to broad use of a restricted, however selected, number of clones. Genetic diversity should be achieved in commercial plantations. 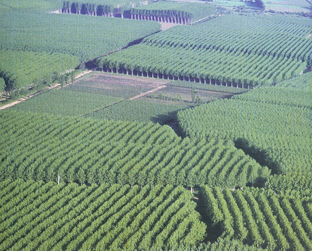 With the above proviso, the cultivation of poplars and willows on agricultural land is to be encouraged. Plantations in agricultural environments fulfil multiple goals: a) producing a commodity whose demand is rapidly increasing while reducing the pressure on natural ecosystems; b) fixing CO2 while producing wood; c) diversifying the environment with cultures that are often less intensive than agricultural crops and provide shelter and food for a wider spectrum of animals; and d) providing new sources of income of rural communities. International conventions recognize the potential of plantations to meet environmental goals. The IPC and FAO should make every effort to ensure that this principle be fully perceived by member countries and given proper consideration in the development of national and international policies. Fast growing trees must be considered an essential component of the sustainable management of the global environment. A wise use of gene technologies is recommended. The benefits should be balanced against potential hazards and the benefits and hazards of currently available technologies. Decisions must be based on sound scientific evidence. Where information is insufficient, research activities are to be strongly encouraged. The awareness on the risks of diffusion of pests and diseases, as a consequence of international movement of people and goods, should be raised among member and non-member countries. Strict control and quarantine measures should be implemented. The adoption of conventions on the protection of breeder's rights should be stimulated, in order to facilitate the exchange of superior cultivars. An important activity that is presently underway is the revision of the 1985 FAO publication Breeding poplars for disease resistance to incorporate information on new techniques and to enlarge the scope to include developing countries that are now important growers of poplars.